I don’t know about you, but I’m dreaming of a white Christmas! It’s a good reminder for me that although, as an adult, snow makes me grumpy to drive in, it’s still nature’s Christmas gift to kids everywhere! Even if you won’t have snow where you live, a lot of people will take to the mountains to experience it or visit family in a chillier area. If so, you’re going to be thinking about sleds! It’s wholesome, it’s classic, and it’s exercise! 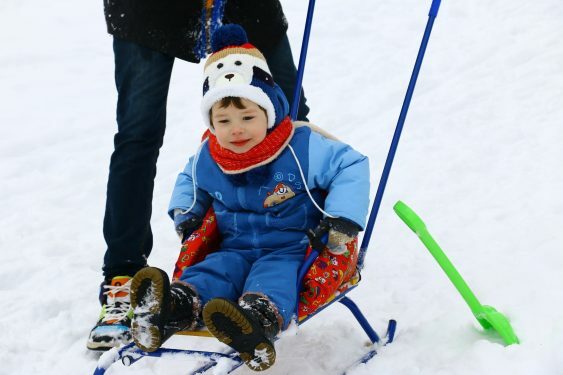 A lot of sleds are good for both children and adults and can be shared with the whole family. It’s a thrill that gets people laughing, having adventures, and playing together for hours! In my experience, if you have a pet dog, he or she will really get into the fun too! I’ll admit, I’m not a skier, a snow shoe-er, or a snow mobiler, and my one attempt at snowboarding was a disaster. But you’ll have to pry my sled out of my gloved but still cold, hands! Safety gear and precaution. Kids move on slick ground at surprisingly high speeds and can’t control their direction. It’s impossible to see lumps under snow that will take them off course. Kid sledding injuries top 20,000 a year and collisions can cause death. Studies suggest wearing a helmet while sledding can cut your chance of injury in half. Helmets designed for winter sports work best. Learn a little about sledding safety before you go. Style. Sleds come in several different designs now. Classic sleds have runners, while some are simple aerodynamic shapes. Each has pros and cons for movement, weight, and ease. The style will also affect your position and how easy it is to stay on it. Weight limit and size. There are some sleds specifically designed to pull small babies and kids in. Others are small and lightweight enough that young kids can use them. And some can hold people of any size! Material. 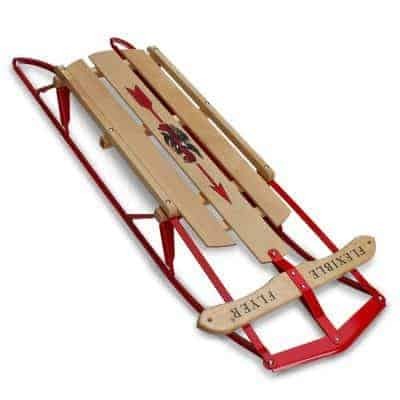 Sleds come in different materials, including plastic, wood, and metal. Heavier duty sleds usually cost more, but they also last longer. This flexible flyer is nostalgic and classic. Made of wood, it has metal runners. It can be used by kids over 5 up to adults. It weighs 12 pounds and holds 250 pounds. Unlike some less expensive options, this sled allows for steering. It’s on the pricier side, but it’s worth it! It comes in two sizes, 48″ for one person, or 60″ for their large size! Both come fully assembled. The Baby Sleigh from Flexible Flyer is absolutely adorable. It’s a classic sled just for toddlers! This is a fully assembled premium product that is handcrafted in Canada. It is made from Northern Hard Rock Maple wood. The sled weighs 11 pounds and can hold babies up to 50 pounds. It has an extra high, wide, protective bar and backrest for baby to lean on and has optional fitted padding that goes with it. This sled is high quality and very heavy duty. Another great offering from Flexible Flyer is this metal disc sled! Does anyone remember sledding on cookie sheets? This might recreate the experience, if you can handle serious slick and spin! It’s a 26″ sled made of durable and heavy steel and weighs 6 pounds. You can even stack a few of them together and throw them in the car! It has rope handles and can handle most adults! The unique trait is that it will spin, which kids love! This sled is simple, compact, and made in the USA! I’m ready to take the kids and go sledding right away with this simple and classic inflatable tube. 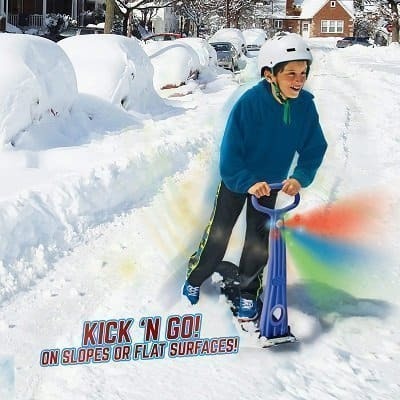 It is not only durable but a ton of fun to slide down the hill in. This sturdy tube will hold kids and adults alike and can support up to 500 pounds. The best part of this snow tube is it is easy to inflate. No need to wait for hours to inflate this tube by mouth. It can be brought to full pressure with a hair dryer or air mattress pump in just a minute or two. Don’t worry–you can still inflate it the old fashioned way with your mouth or use a bike pump if you have one handy. 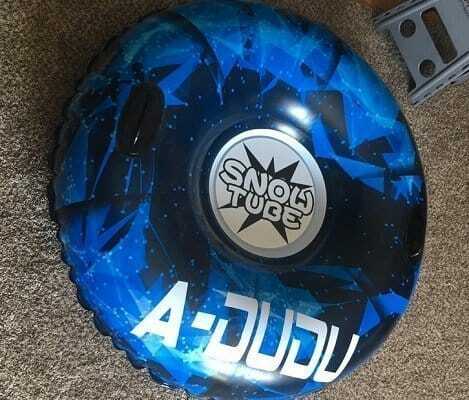 The A-DUDU tube even comes with a patch in case you run into a few rocks during your tubing adventure. 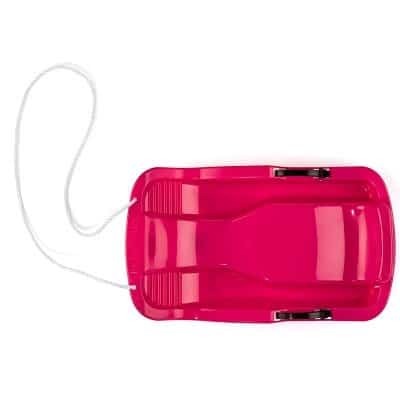 This style from Lucky Bums is a fun plastic toboggan that comes in four bright colors. 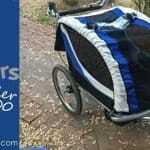 It comes in a 26″ size and a 34″ size, both with tow handles. It has built in brakes for slowing and steering. The plastic is cold resistant, which is a great feature. An ergonomic seat with taller back support makes this sled comfortable, and the foot rests grip so that your feet don’t slip! This toboggan is sturdy and high quality; it will definitely last several winters! One word of warning: if you grab the brakes hard, it slows the sled but might end up dumping you in the snow! 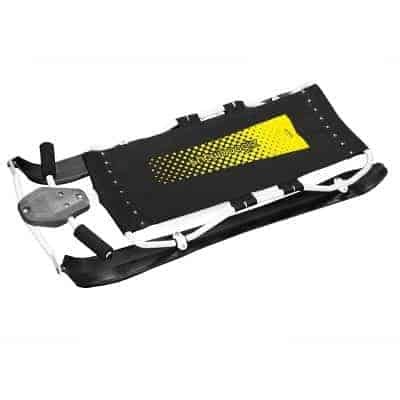 The Flexible Flyer foam sled is a great choice! It’s lightweight (weighing only 3 pounds) for easy carrying. Two people can ride together, and there are 4 hand grips–two for each rider. It’s made of both foam and plastic. The plastic bottom is durable and makes it slick and fast. The foam absorbs bumps for a smoother ride! It can hold up to 250 pounds, and has a fun sporty print! If you want a totally unique design, try out the Zipfy Luge sled! It comes in 7 colors (red, orange, yellow, green, blue, purple) and is lightweight. 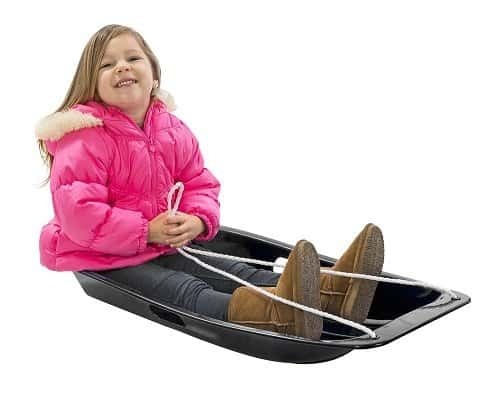 This is a popular one person sled that can hold up a six-year-old or up to 250 pounds! With this sled, you straddle it with your legs straight out and hold the lever to steer. To stop, you can pull back so the rear digs into the ground and you can also drag your heels down. 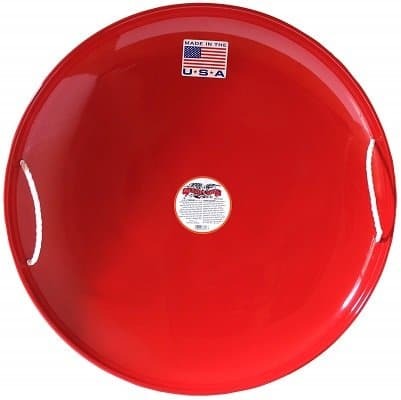 This is a durable sled that will last many sledding seasons. Kids love the unique design! 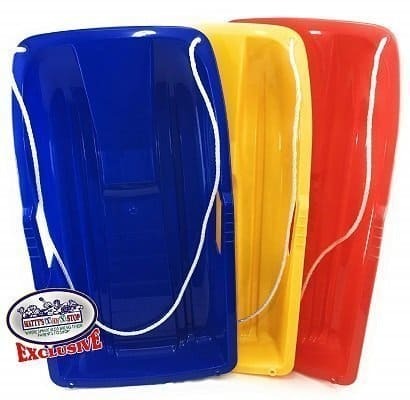 Avoid fighting over who gets to use the sled with a gift set bundle of 3 sleds in red, yellow, and blue! These are 26″ plastic toboganns that have hand grips and a tow rope for pulling. They can accommodate 1 large or 2 small kids! Some people even use them on sand dunes. You can also use them to haul your winter gear! And you won’t lose them in the snow, with those bright colors! 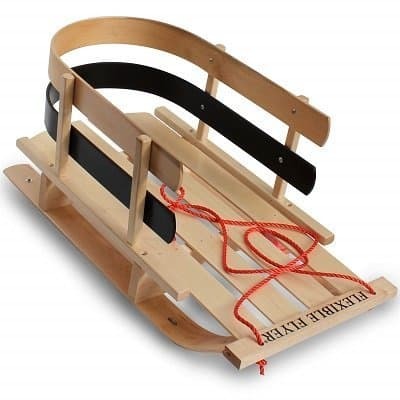 Coming in at either 33 or 48 inches, depending on which model you choose, this toboggan is a best seller! It comes in black, green, pink, orange, and ice blue! It’s a simple, slick, and light weight design. It’s made for one rider and includes a pull rope. Lucky Bums products offer total assurance to help with any issue, big or small. Lucky Bums is a family company that offers accessories like helmets too! GeoSpace’s Ski Skooter is another unique option! It’s a little snowboard with a tall handle to hold. The handle folds down for storage. What makes it exciting is that it illuminates the way with 2 LED light modules. It comes with a remote control to make a multi-colored light show with 20 different light functions! 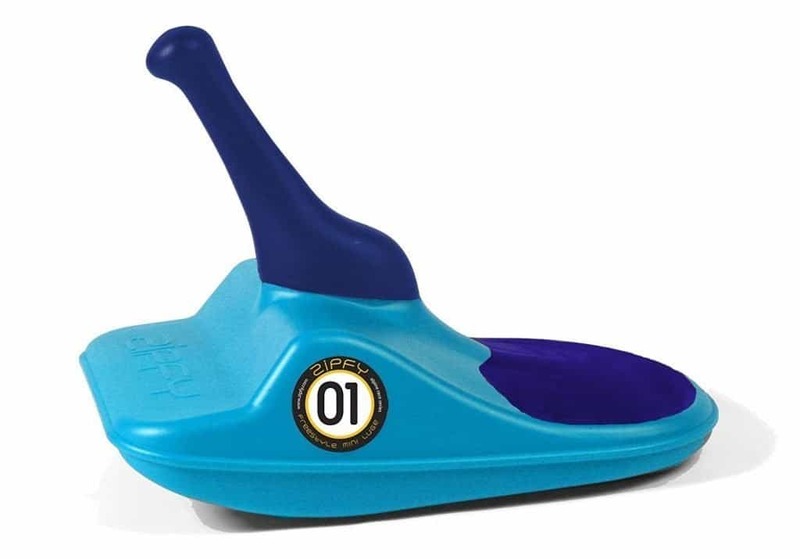 The sled weighs only 3 pounds and comes in assorted colors. It can be used on any smooth surface like sand, grass, or carpet! 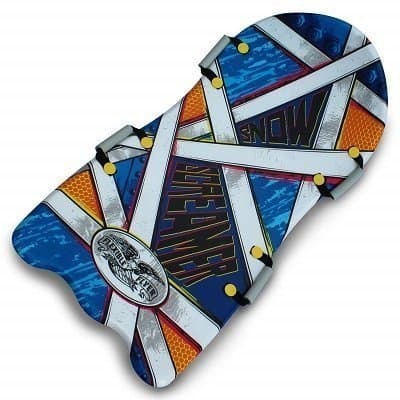 Keep in mind, that although it is described for ages 4-6 and up, the dimensions of the board are 36 X 31 x 9.75 inches and the handle is a little shorter than the board. So small or tall kids might not be as comfortable. If your kiddo likes skateboarding, this is a fun option. This sled is a little more advanced and pricey! It’s made of durable metal alloy and two skis on the bottom. It can be used sitting up or head first! The skis are wide, so they will work in well in more snow conditions! 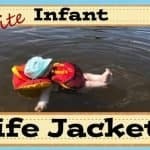 This is an excellent choice for older kids, as it tends to go faster than some of the other options. As you can see, there’s something for everyone! Sledding is a great winter family tradition to introduce to your kids, or keep going in your family. Some kids just want to play outside, and this is an amazing way to keep that going even through the cold months. A few of these sleds can even be used on grass or sand. I can’t imagine a more exciting thing to spy under the Christmas tree on Christmas morning!